Get ready for the ninth installment of the ever popular and spirited festival of remembrance and revelry! On this date, it is believed that the gateway between Mictlan, the ancient Aztec land of the dead, and our own opens up so we can dance and sing with our lost loved ones for one special time of year. With just 750 attendees in 2010, the event swelled to over 10,000 participants in 2017. The Celebration is a creative spectacle honoring Mexican and Latin American traditions while generating modern interpretations that connect with a broad spectrum of demographics. Rooted in community, this event embraces a universe of ideas from a legion of talented skull inspired artists, mariachi musicians, painted performers and enthusiastic skeleton clad revelers. 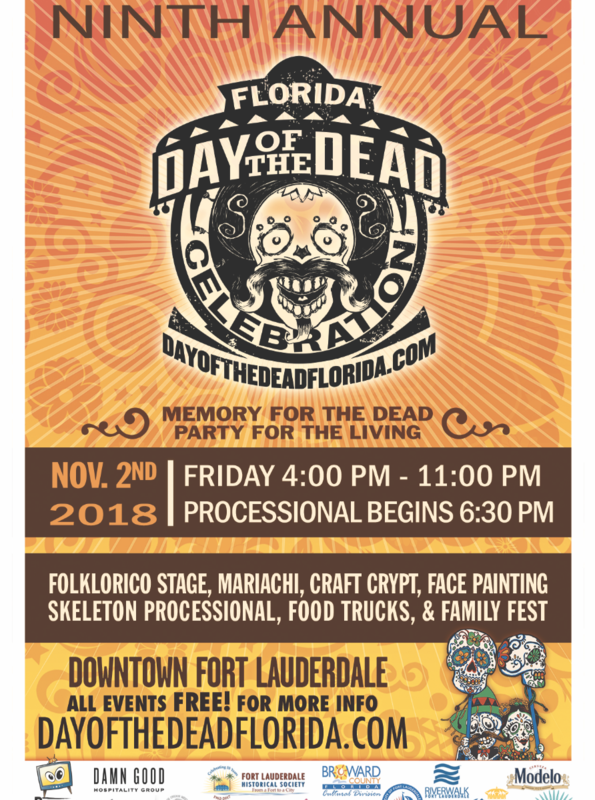 This skeleton-inspired celebration is centered at Riverwalk – Fort Lauderdale, Revolution Live Entertainment Complex, and Fort Lauderdale History Center in downtown Fort Lauderdale. Participants will begin to gather FRIDAY for CALAVARAS IN THE PLAZA at 4PM in Huizenga Plaza on Las Olas Boulevard for craft activities including mask and puppet making along with sugar skull face painting to help the little ones prepare for the event. It will be underscored by traditional live music and traditional from the stage. A few blocks West along the River at the New River Inn, make sure to experience the heartfelt OFRENDAS EXHIBITION where traditional altars of remembrance have been created using sugar skulls, food, art and artifact for those who have have passed. Some are traditional, some artistic, all deeply meaningful to each builder. Alongside the Ofrendas, view a whimsical take on death through an exhibition of over 20 paintings by Heather Calderon in the New River Inn open from 4-8pm. The main event spectacle begins when the community will converge up in traditional skeleton garb at Fort Lauderdale’s Huizenga Plaza for the SKELETON PROCESSIONAL. At 6pm Officials from the Fort Lauderdale City and Broward County Commissions and the Consulate General of Mexico shall welcome participants. 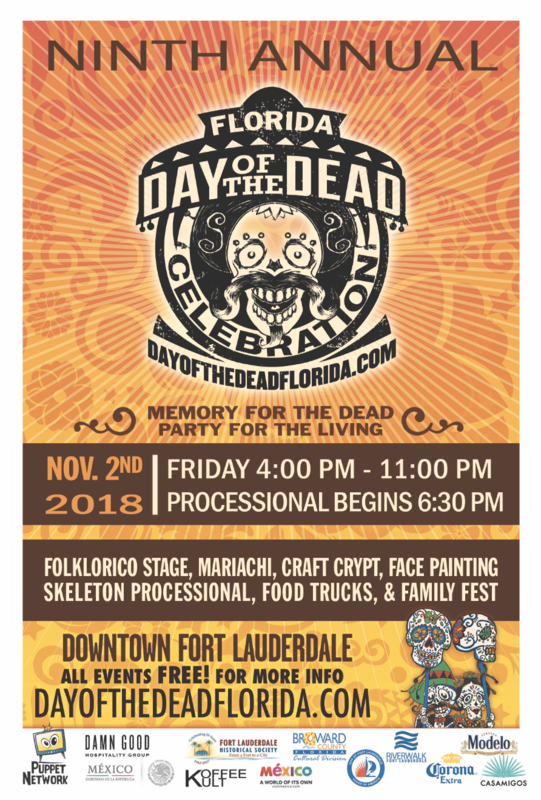 At 6:30pm led by Event Founder Jim Hammond from PUPPET NETWORK and his giant skeleton puppets, over 50 giant puppets up to 19’ tall and 1000 skeletons will follow Mariachi Musicians along Riverwalk Fort Lauderdale towards SW 3rd Avenue in a colorful sidewalk parade through the Fort Lauderdale Historic District. The Processional ends at the FOLKLORICO STAGE at SW 3rd Avenue which will be closed for our MUERTOS STREET FESTIVAL from 5-11PM. On the Stage, experience the best traditional folkloric dance and mariachi in South Florida. There will be original indie art and crafts for sale in the CRAFT CRYPT in Revolution Live and America’s Backyard nightclubs. Craft projects, face painting and more will be available for children in LOS ANGELITOS VILLAGE. Interspersed throughout, you will find art installations, pop up ofrendas, mask making art tents, Latin American food trucks and interactive street performers.